YUKON—A church that was started by a network of more than twenty Oklahoma Baptist Churches recently celebrated ten years of being in their location at 11715 NW 10th Street, Yukon. The congregation called Yukon Church began as a cooperative effort of Baptist churches called the “Church Cluster Team” from Central and Grady Associations which came together to plant a new work in that city. The church gathered in their facility on March 10 to celebrate the milestone and rejoice being debt free. Henson and others plant trees on the property of Yukon Church. “For about 18 months they had already been praying and collecting money. When they approached me, they said, ‘Okay, here is what we are doing. We need somebody who will go do the work,” Henson said. 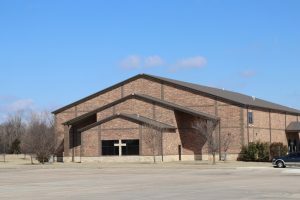 The group of churches formed a team including leaders from Rush Springs, Vimy Ridge; Blanchard, Middleburg; Hennessy, First; Chickasha, First; Chickasha, College Heights; Ninnekah, First; Calumet, First; El Reno, First; Minco, First; Greenfield, First; Pocasset, First; Alex, Southern Chapel; Crescent, First; Calumet, First; Kingfisher, First; Central and Grady Association. The team drew up an agreement with Henson, helped fund the new work and kept in close contact with him. “I met with those collective pastors occasionally. They decided that since El Reno was closest to us, that I would answer weekly to John Chennault of First Baptist. They let me use their copy machine and took care of all of our finances. The three ladies that worked in the office at the time helped me in any way I needed,” Henson said. In the early years of the church, members met in a rented facility before moving into a new building in March of 2009. 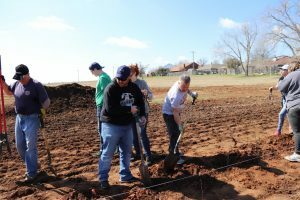 Over the past 15 years the church has established a legacy of generosity in giving through the Cooperative Program to their association and by sponsoring missions work through various initiatives both inside and outside Oklahoma. Since its inauguration, the congregation is on track to have made gifts of one million dollars by the end of 2019. Currently, the church is advancing the legacy of the founding Church Cluster Team by planting a new church in Deer Creek. “The cluster included in our church planting agreement that our church would put back half a percent of our budget for a future church plant. We have saved up $38,000 which we will invest in a new church to be planted by BGCO church planter Stephen Earnest in the Deer Creek area, it will be called Mission Bible Church,” he said.